Sounds too good to be true; an alcohol (meths) stove that’s efficient, <15ml for a 500ml boil (1/2oz for 2 cups); simple to build, 2 mins; really cheap, ~£1.50 each. I’ve previously written of my conversion to the Zelph Starlyte stove & subsequently the issues I had in Trouble with the Starlyte. The repairs I conducted, gluing the components back together with high temperature silicone worked but resulted in a stove with a markedly smaller flame & a much longer boil time, so not really a great success. The other issue I’ve had with the Starlyte is the lids splitting (I’ve had 3 fail) rendering them useless for storing fuel on the move. Since the lid’s a non-standard size, saving ordering more from Zelph in the US, they’re not available; so the search for an alternative set out. I’m a convert to using wick type stoves as I’ve found them efficient (uses least fuel), easy to light (even in freezing weather), they don’t need priming & are spill proof. I came across the Speedster stoves; their 30ml stoves is of very similar diameter to the Starlyte but based upon a aluminium screw top cosmetic pot filled with a wicking material & capped by fine stainless steel mesh; not too expensive at £5.70 inc p&p; quite small at ~55mm diameter (over the cap) & ~19mm high; very light ~14g. Testing of the Speedster established that is was of very similar efficiency to the Starlyte but with a shorter boil time. The only minor niggle I had with the 30ml Speedster was the fairly low profile; I thought it was a bit too easy to overfill & with cold wet hands it’s awkward to hold onto the base to get the screw cap off if it’s been nipped. I did check out whether the screw cap was effective at retaining fuel & after 48hrs on the bench there was no measurable loss. The longevity of the lid wadding (gasket) may be an issue but time will tell & it’s probably easily replaceable with thin card on the trail. I quite liked the idea of using the aluminium screw top cosmetic pot & soon found there were a variety of sizes on the eBay & AliExpress & providing you are willing to wait the 2 – 4wks for delivery from China they’re very cheap, £2-3 for 5. So thought it would be appropriate to look at different diameter containers to see if this eked out any better performance. In my experience the capacity needed to be a minimum of 30ml; a good setup should only need ~15ml of fuel to achieve a 500ml boil but I’ve found that overfilling (say 25ml) & then snuffing when boil is achieved is more efficient than measuring. It does mean than a vapour proof cap is essential to stop the remaining fuel subsequently evaporating. That meant the only real variables I had to decide up were flame size (the throat diameter of the pot) & the fill (wick) material. The most efficient flame size is dependent upon the pot diameter; the larger the pot diameter the larger the flame diameter which can be used while still being efficient; the smaller the pot the smaller the flame which must be used to retain efficiency & hence longer boil time. I’ve standardised my cooking kit for long distance walking around the Trail Designs Caldera Tri-Tri with a 900ml Evernew UL pot (~130mm dia) so my primary focus was to find a stove that matched this. The standard Starlyte has a throat of 47mm diameter while the Caldera Cone version has a throat of 36mm, the 30ml Speedster has a throat of 48mm, only slightly larger than the Starlyte & this is probably behind the faster boil time. The only different diameter containers, to the Speedster, I could find available was a 30ml pot of slightly smaller diameter, (50mm nominal diameter & 25mm high with 42mm throat) which would also eliminate my concerns over unscrewing the top & a 50ml pot (59mm nominal diameter & 27mm high with 52mm throat); I bought & tested both. I tried various types of fill materials (wick) finding that the fill does have an impact upon fuel efficiency, the best I found was 25mm thick ‘Insulfrax’ ceramic blanket. The blanket is silicate wool used for furnace insulation, etc; 1200C rated & adsorbs fuel readily. It’s usually sold in rolls at quite high cost, £20+ / m2, but I found some reasonably priced off-cuts on eBay; £3.25 got me 10 * 100mm diameter discs, enough to make at least two dozen stoves; the material is very easy to cut with a sharp craft knife to the diameter of the pot. The fine SS mesh covering the wick is not strictly necessary; if the insulation is a snug fit it’s unlikely to fall out; I tested stoves both with & without he mesh & found no difference in performance. The stove is easier to light both with a lighter or with a fire stick without the mesh. The mesh is available on eBay but I found the cheapest source was a frying pan anti-spatter guard, £1 from the local discount store. Discs about 12 – 15 mm oversized are easily cut out with a pair of scissors & the edges simply bent down with the fingers to form a cup; a bit of care is needed during assembly to ensure that any loose wire strands are tucked down so as not to impact the lid seal. Tests were based on bring 500ml of water to the rolling boil in the Caldera Tri-Tri with the 0.9L Evernew pot 0.9L (ECA-252R) within a barn (no appreciable breeze), ambient temperature 6 – 7 C. Each stove, & variants were filled with around 20g of ethanol & then the weight checked on completion of the test after cooling down, to where the lids could be replaced (digital scale resolution 0.1g); this simulated my usual squirt & fire up routine with these stoves rather than pre-measuring. For typical 3 – 7 day trips I think I’d choose the MYO 50 with the Caldera Cone/ Evernew 0.9L combo as I reckon the slightly increased stove output will overcome any increased heat losses due to using in a draughtier environment with only minimal loss of theoretical efficiently; it’ll also easily hold sufficient fuel (40ml) to complete a large snow melt; it may also get the morning coffee a little quicker. For longer summer trips where I generally want to eke out fuel use I’ll use the MYO 30, it’ll also suit the Alpkit Mytimug 650 (96mm dia) for lightweight summer overnighters or a simple brew kit. Generally have been very pleased with the performance of the stoves …… BUT …… I have had some problems with the screw lids sticking usually they have eventually succumbed to brute force except for one occasion when a penknife had to be used to cut a hole in the lid. The stove in question had been well used & left sat inside the pot for a month, subsequent dismantling showed corrosion on the threads (ethanol corrodes aluminium, methanol is even worse). To try & minimise these problems I’ve taken to lubricating the threads with a smear of ‘copper slip’ grease. I’ve also replaced the 1mm thick card wadding (gasket) inside the lids with a 1.6mm thick silicone one cut from a cheap baking dish, being a resilient material much less force is required to get a good seal & hence less force to undo……… so far the modifications have proved a success. That’s very interesting, Paul, and must be a significant weight saving. I’m tempted to stick with gas and my Primus Eta Solo despite the extra weight as I hate the smell of meths and sooner or later there is always a leak. Bioethanol it doesn’t stink like meths & is widely available. I’ve never had a fuel bottle leak & it’s always carried in a side pocket just in case. The capped stove goes inside a small zip lock before going inside the pot so double protection against any possible contamination. It would be interesting to compare your findings against the 12-10 stove that is designed for the cone. Any thoughts on doing that at some point? I did do some performance of the 12-10 stove at the same time but gave up when I found that I couldn’t get a boil with 17ml of alcohol, the stove may perform better with something like the Evernew 1.3L; definitely no good for the Evernew 600 IMO. The other criticisms I have with the 12-10: more difficult to get going in cold weather if you don’t ‘waste’ fuel using the priming pan; fuel needs to be metered; the 12-10 is relatively bulky & will not fit inside the pot with the sidewinder, in comparison I can fit the Sidewinder + Starlyte or MYO stove + a 50ml bottle of meths inside the Evernew 900 UL. Thats really weird Paul. I have the 600ml Evernew and the Caldera with the 12-10 and it is simply superb. On the TGOC i met a chap who had the same stove as you are testing here and which i subsequently bought and i found it didn’t perform as well as the 12-10. I am away this week but when i come back i will do a test and see what i get and we can do a comparison. I am now intrigued and need to get to the bottom of this. Maybe a different cone? With the Evernew 900 I have the sidewinder cone which needs to use 2 pegs to achieve the recommended flame gap for the 12-10 but there very still a lot of flame visible up the side of the pot, more of a gap may give better performance. Nice to make your own. The 50 looks a useful size. The figures for the MYO30, Speedster 30 and Starlyte are so close that I suspect with many tests of each, it would be hard to find any real difference in performance? I’ve very happily used Starlytes since 2010, but a year or so ago bought some Speedsters to compare. pretty much the same performance, but less quality build finish. Had to glue some the non screw cap type together myself! The main problem as you say is getting the lid unscrewed. The threads seem to regularly jam with aluminium dust. After last weekends frustration – thought I wouldn’t get hot dinner at one point it was so hard to remove the lid. I’d decided I’d finally had enough of the screw lid type and ordered a new Starlyte and 3 spare lids. Back to hassle free stove use! I’ve taken to using a smear of copper grease on the treads to reduce the possibility of a seized cap but the geometry of the 50ml pot also helps a lot. Though it sounds like you’ve had problems with Starlyte lids breaking? Do you think maybe because they got colder in your winter trips? Still on my original lid from when Dan first sold them (with my 2nd Starlyte stove) but got the rest for spare/adding to the similar speedster made ones I have. I’ll keep an eye on my lids! And try some copper grease. Did a bit of a test this week. This is what i found. 500ml tap water. Ambient temp 7 degrees C.
12-10 with 20ml of meths had a rolling boil in 7.6 mins with 3 ml of fuel left. So calculating, the stove would have burned for 8.9 minutes in total. Same quantities with the starlite. Boiled in 9.00 minutes and continued to burn at a reasonable heat for 12.4 minutes. So you do get more burn time with the Starlite and therefore the cost is better, although its a bit slower to boil than the 12-10. I trust the 12-10 in adverse weather so i guess its down to getting used to the Starlite or if i am bothered about using a bit more meths to get quicker hot water. My gut feel at the moment is that i would rather have a quicker brew. Hi – just wondering which cone you’re using with the MytiMug 650? I’m looking into cones and stoves for this post so what you’ve done here is very interesting, thanks! Generally just been using the MytiMug 650 as a big winter mug so it goes on the Kovea spider. 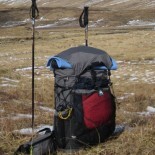 I’ve a simple Ali foil cylinder windshield, mug supported on 2 skewers, that’s OK for on overnighter (soup, noodles, etc). Most of my cooking needs a bigger pot, typically my MYO meals + 125g of pasta needs 500ml water so volume is around 600ml + need room to stir; if I’m knocking up a trail meal with fresh ingredients added (onion, tomatoes, etc) volume may be higher. Most of the time I’ll use the 0.9L Evernew UL with a Tri-tri sidewinder or in the depths of winter the 1L Evernew Pasta pot with the Kovea Spider. The 0.9L Evernew and Sidewinder is my go-to set up, absolutely love it! I originally got the MytiMug 650 for drinks, but am wondering now about using it for when I really want to travel spartan and light. I’d use it to boil water for bag meals, and it’ll serve the double function of being my mug too. So I’m looking at cones that’ll work with it and my Starlyte stove. Saying all that, I much prefer to actually cook and eat out of a pot, rather than a bag. Where can one find bioethanol Paul? Don’t like the smell of meths either. Is bioethanol ‘denatured alcohol’? Unless you can it find local (I’ve found it in B&Q, ‘Hacienda’) it can be expensive for small quantities. The last I got was from Ebay think it was THIS STUFF, less than £3 / L. Econol fuel is pretty good & about the same cost for 12L. Bulk buy for friends? I reckon I’ll be set for a long while. DO NOT buy Methanol, lower heat output as well as being poisonous (skin, vapour & consumption). Thanks Paul, I’ll check it out. This entry was posted on April 13, 2016 by Paul Atkinson in Gear, MYOG and tagged Gear, MYOG, stove.